Save the date magnets are a perfect way to have your guests save the date for weddings, anniversaries, parties, birthdays or any special event. Most can be personalized with your names, date and location. There are some save the date magnets that can be personalized with photos. These cute bee save the date magnets are perfect to let out of town guests know to reserve that date for your special event. Don't forget the in town guests. They may have busy schedules also. Each magnet measures 3.5" x 2", which would fit in a 3.5" x 5" envelope (not included) These are flexible heavy weight magnets. 1 week lead time to print. Price is per bee save the date magnet. Must order in increments of 10 after the minimum order of 20. Add personalization in the comment field below. These cute bell save the date magnets are perfect to let out of town guests know to reserve that date for your special event. Don't forget the in town guests. They may have busy schedules also. Each magnet measures 3.5" x 2", which would fit in a 3.5" x 5" envelope (not included) These are flexible heavy weight magnets. 1 week lead time to print. Price is per bell save the date magnet. Must order in increments of 10 after the minimum order of 20. Add personalization in the comment field below. 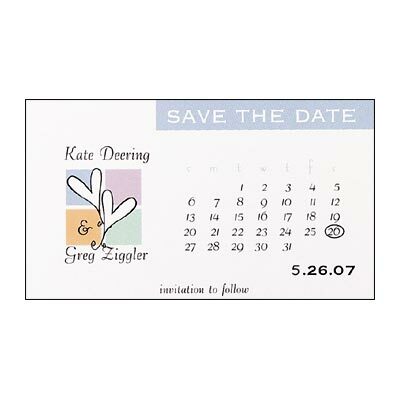 These cute butterfly save the date magnets are perfect to let out of town guests know to reserve that date for your special event. Don't forget the in town guests. They may have busy schedules also. Each magnet measures 3.5" x 2", which would fit in a 3.5" x 5" envelope (not included) These are flexible heavy weight magnets. 1 week lead time to print. Price is per butterfly save the date magnet. Must order in increments of 10 after the minimum order of 20. Add personalization in the comment field below. In order to place an order containing artwork or a photo on our site, you must transmit your Content to us. While we are not responsible for the content of your submissions, we and our suppliers reserve the right to refuse to process your order and reject your submission that we, in our sole discretion, determine is abusive, defamatory, obscene or in violation of copyright or trademark laws or is otherwise unacceptable. We or our suppliers may request confirmation of the copyright or trademark ownership from you. We reserve the right to suspend the shipping of an order before such confirmation is received. If we do not receive any such confirmation or if there are continued claims of copyright or trademark infringement, we reserve the right to share certain account information with government organizations or third parties. If you dispute any copyright or trademark infringement claims, we will share with you the contact information of any party claiming such infringement. As a condition of using our service, you represent and warrant to us that you are the owner of the copyright to Content you submit or that you have written permission of the copyright owner to submit such Content. You are prohibited from transmitting any unlawful, threatening, libelous, defamatory, obscene, scandalous, inflammatory, pornographic, or profane material, or any other material that could give rise to any civil or criminal liability under the law. 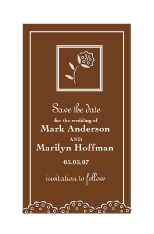 This simple apricot save the date magnet will feature your photo and wedding date being highlighted with two circles. Layout, lettering, verse and imprint color available only as shown. Price includes printed card, adhesive magnetic backing and bright white envelopes. Customer assembly is required. Prices are in the pricing drop down box. Please enter your personalization in the comment field below. "&" is artwork and cannot be changed or removed. You must have permission to reproduce a photo if it is copyrighted. Your photo will be reproduced exactly as submitted. Please email your photo in jpg or gif format after you receive your order confirmation. Just reply to the confirmation with the photo attached. This simple save the date magnet will feature your photo and wedding date being highlighted with two circles. Layout, lettering, verse and imprint color available only as shown. Price includes printed card, adhesive magnetic backing and bright white envelopes. Customer assembly is required. Prices are in the pricing drop down box. Please enter your personalization in the comment field below. "&" is artwork and cannot be changed or removed. These cute flower save the date magnets are perfect to let out of town guests know to reserve that date for your special event. Don't forget the in town guests. They may have busy schedules also. Each magnet measures 3.5" x 2", which would fit in a 3.5" x 5" envelope (not included) These are flexible heavy weight magnets. 1 week lead time to print. Price is per flower save the date magnet. Must order in increments of 10 after the minimum order of 20. Add personalization in the comment field below. One bride plus one groom equals one perfect wedding so make sure your save the date matches! This bright white magnet features a design of a tuxedo plus a wedding dress equaling a happy mr. and mrs. Layout, verse and imprint color available only as shown. Price includes printed card, adhesive magnetic backing and bright white envelopes. Customer assembly required. Prices are in the pricing drop down box. Please add your personalization in the comment field below. Leg Poppin Proposal Save the Date Magnets Leg poppin proposal save the date magnets are cute. Not only was the bride surprised when he popped the question but your guests will be too when they receive your save the date invitation. 4 7/8" x 3 1/2"
Mini Magnet Heart Frames Send this Mini Magnetic Back Heart Photo Frame to your family and friends as a save the date reminder or a place card holder. You can also use it as a favor for your wedding reception. Price is per set of 3 mini heart magnet frames. Made of silver aluminum. Minimum order is 4 sets. Purple polka-dots and colorful stripes will highlight your photo on this fun save the date magnet. Layout, verse, and imprint available only as shown. Price includes printed card, adhesive magnetic backing and bright white envelopes. Customer assembly is required. Prices are in the pricing drop down box. Please enter your personalization in the comment field below. "&" is artwork and cannot be changed or removed. 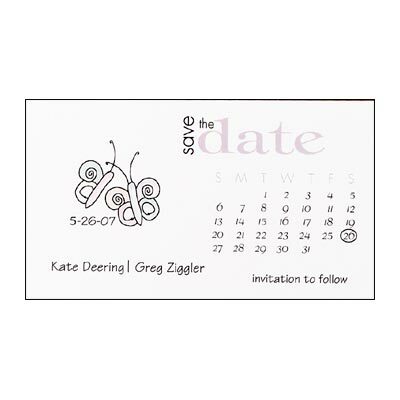 Save the Date Magnets - Butterfly Design Send this butterfly save the date magnet design 3 1/2" x 2" magnet as soon as you have determined the date of your wedding so guests can plan well in advance. The save the date cards feature your first and last names, the phrase "invitation to follow" and the calendar month of your wedding with your date highlighted for your guests. Simply attach save the date cards to the magnetic backing included. Names and date available printed in flat black ink only. The design and lettering style is available only as shown. Production time is 5 working days. Blank, single envelopes are included. Put your names and date in the comment field below. Prices for the butterfly save the date magnets are in the quantity pricing drop down box. 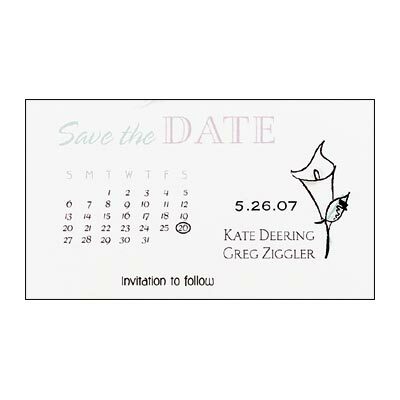 Save the Date Magnets - Calla Lily Design Send this calla lily save the date magnet design 3 1/2" x 2" magnet as soon as you have determined the date of your wedding so guests can plan well in advance. The save the date cards feature your first and last names, the phrase "invitation to follow" and the calendar month of your wedding with your date highlighted for your guests. Simply attach save the date cards to the magnetic backing included. Names and date available printed in flat black ink only. The design and lettering style is available only as shown. Production time is 5 working days. Blank, single envelopes are included. Put your names and date in the comment field below. 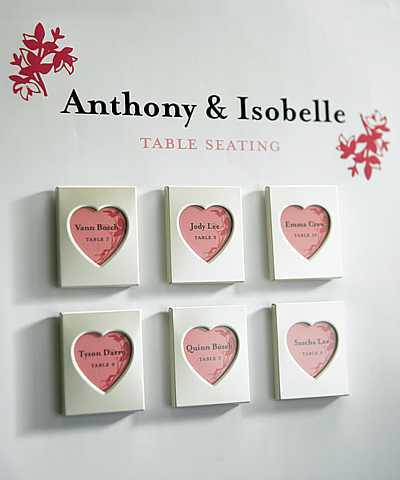 Prices for the calla lily save the date magnets are in the quantity pricing drop down box. 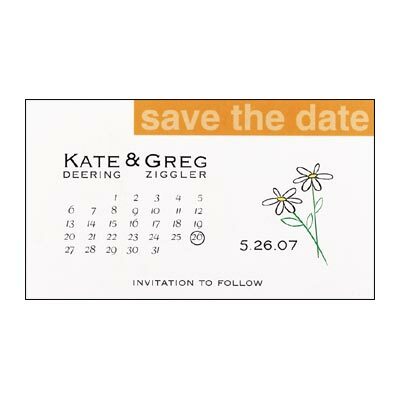 Save the Date Magnets - Daisy Design Send this daisy save the date magnet design 3 1/2" x 2" magnet as soon as you have determined the date of your wedding so guests can plan well in advance. The save the date cards feature your first and last names, the phrase "invitation to follow" and the calendar month of your wedding with your date highlighted for your guests. Simply attach save the date cards to the magnetic backing included. Names and date available printed in flat black ink only. The design and lettering style is available only as shown. Production time is 5 working days. Blank, single envelopes are included. Put your names and date in the comment field below. Prices for the daisy save the date magnets are in the quantity pricing drop down box. Save the Date Magnets - Heart Design Send this heart save the date magnet design 3 1/2" x 2" magnet as soon as you have determined the date of your wedding so guests can plan well in advance. The save the date cards feature your first and last names, the phrase "invitation to follow" and the calendar month of your wedding with your date highlighted for your guests. Simply attach save the date cards to the magnetic backing included. Names and date available printed in flat black ink only. The design and lettering style is available only as shown. Production time is 5 working days. Blank, single envelopes are included. Put your names and date in the comment field below. Prices for the heart save the date magnets are in the quantity pricing drop down box. These cute tropical save the date magnets are perfect to let out of town guests know to reserve that date for your special event. Don't forget the in town guests. They may have busy schedules also. Each magnet measures 3.5" x 2", which would fit in a 3.5" x 5" envelope (not included) These are flexible heavy weight magnets. 1 week lead time to print. Price is per tropical save the date magnet. Must order in increments of 10 after the minimum order of 20. Add personalization in the comment field below.